Someone tell me why I should care about these? They look like a Sigma crossed with a M&P. Interesting how S&W chose not to design these with removable backstraps. 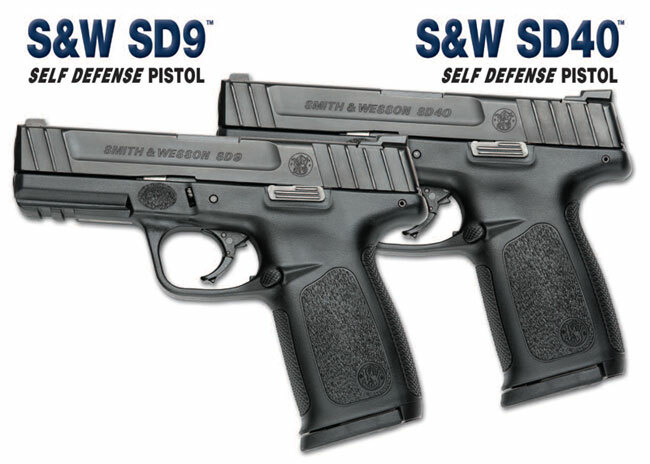 Maybe the “Self Defense Trigger” (SDT) is the selling point? Who knows … anything would be an improvement on that scratchy mushy M&P trigger. The design of this “new” trigger looks the same with the joint right in the middle, so I’m not holding my breath in anticipation of it being awesome. I’ll hold further judgment until I try it out someday though. Thanks but no thanks… For now I’ll be sticking with Glock to fulfill my polymer pistol needs. Yawn is right. I like my S&W revolvers, but you won’t see me switching to them for their polymer pistols until they come out with something that isn’t a 2nd rate copy. I like them. I have a Sigma and really like it! I’ve done a few mods to fix the heavy trigger on it though but once I did it shoots great. These look like an upgraded sigma. I’d imagine they will be selling for a lot cheaper than the MSRP. I agree yawn but like in all good marketing, you can try to the uninitiated. Do I spy a place on the frame ahead of the trigger to reinforce the prevailing thumbs forward grip in hopes of usurping the teacup style? Hey – at least they are doing something active to show shooters where their thumb should be. All I saw was a new Sigma. Not a bad piece, but not at S&W prices. Had a Sigma and hated it. I agree, it looks like a Sigma/M&P hybrid. I see nothing with this Self Defense pistol that makes me want to go out and drop five bills and some change. Smith just hasn’t designed the next best polymer pistol. What they have come up with are three mediocre, overpriced polymer pistols. I tested a glock and it felt like it was made for a woman. The damn thing was too short for my hand and felt funny. I had a Sigma 40 and naver had any trouble until the last time i went to the range. The slide didnt lock back, and it started to shoot low. Sent it back today. To replace it I got the SD9, love the way it feels and cant wait to shoot it. If glocks didnt feel so funny in my hand I would get one. The SD9 fits my hand, and to me thats what counts. I have an SD9 VE that I got over a year ago. I shoot every Saturday and it has been flawless. Not one single FTF or FTE. I can shoot a one inch grouping at 30 ft with it. I paid 289.00 for it and I see no way that a 550.00 Glock can outperform something that performs perfectly. I guess of course there is that “well I only own Glocks because I’m special” thing but some of us have more brains than money.